The International Development Speaker Series, in conjunction with the RAND Center for Latin American Social Policy, organized a discussion among the Los Angeles-based Consuls General of the Pacific Alliance. The Pacific Alliance is an initiative originally signed in April 2011 and implemented in July 2015. It includes Chile, Colombia, Mexico, and Peru. One of the Alliance's main objectives is to become a platform with open markets, free movement of services, goods and people, and complete access to education, employment, and pension systems. 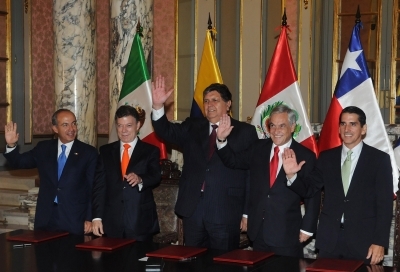 The Pacific Alliance emphasizes cooperation with the Asia-Pacific region. The Alliance is described as a trade group of the 21st century, because it does not follow the usual theoretical model approach of a trade group. Instead, it focuses on practical approaches that address and solve social problems at the community and individual level. The idea is to impact the lives of regular citizens; for example, their quality of life, their jobs, and their access to education. A few of the main economic achievements of the Alliance so far are: it has decreased inflation in member countries to approximately 3%, reduced about 92% of tariffs and export taxes, decreased extreme poverty rates from 13.8% to 4.7%, and promoted economic stability. The four speakers are each the Consuls General in Los Angeles, representing their respective countries.